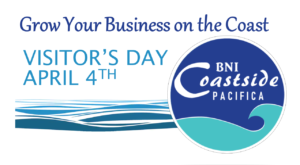 LOOKING TO GROW YOUR BUSINESS ON THE COAST? Come to breakfast with the leading networking group on the coast. Learn how joining BNI can help build your business and meet individuals who can become your marketing team. Cost is $25 for breakfast and networking. Event Registration: here! April 4th – 8:45am-10:30am – at A Grape in the Fog.